HTTP stands for hypertext transfer protocol and is used to transfer data across the Web. The first version of the protocol had only one method, namely GET, which would request a page from a server. To give you an idea of how simple the HTTP protocol started out take a look at the Original specification ( only 1 page). There have been several versions of HTTP starting with the original 0.9 version. The current version is 1.1 and was last revised in 2014. See Wiki for more details. Like most of the Internet protocols it is a command and response text based protocol using a client server communications model. The server responds to a request. The requests(commands) and responses are in readable text. The requests are independent of each other and the server doesn’t need to track the requests. A command or request + optional headers + optional body content. A status code + optional headers + optional body content. A simple CRLF combination is used to delimit the parts and a single blank line (CRLF ) indicates end of the headers. If the request or response contains a message body then this is indicated in the header. The presence of a message body in a request is signaled by a Content-Length or Transfer-Encoding header field. Request message framing is independent of method semantics, even if the method does not define any use for a message body. – RFC 7230 section 3.3. We saw the general request response format earlier now we will cover the request message in more detail. /testpage.htm is the relative path to the resource. A relative path doesn’t include the domain name. The web browser uses the URL that we enter to create the relative URI of the resource. Note: URL (uniform resource Locator) is used for web pages. It is an example of a URI (uniform resource indicator). The actual request is not shown by the browser, and is only visible using special tools. e.g. the Firefox add-on Live HTTP headers. Response Status codes are split into 5 groups each group has a meaning and a three digit code. For example a successful page request will return a 200 response code and an unsuccessful a 400 response code. 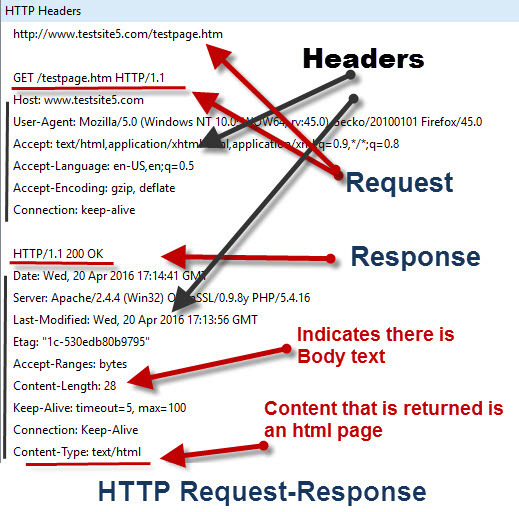 and here is a screen shot of the http request-response that happens behind the scenes. Notice the headers that are automatically inserted by the browser and also the headers in the response which are inserted by the web server. There is no body content in the request, and the body content in the reply, which is a web page, is shown in the browser, and not by the live headers tool.